Are you bored of sending and receiving arid chats? Here is what you are craving for ‘ClipDis‘. ClipDis spices up the unadorned, usual text messages with humorous movie mash-ups. Using ClipDis, you can master the art of mash-ups in a flash. Type and tap in a button to create your own movie-chat. It was never so easy to create super fun videos out of a boring text messages. This is an app to tickle your humor! What else, can you do with it? If you love the spotlight, being funny can magnetizes interesting friends. Be the cool commenter on http://www.reddit.com/ . Do not mind to send dirty messages because it is still funny, using ClipDis. Say ‘I Love you’ to your darling in 156 different ways. You can just laugh about while our sitting on toilet. Meet the Makers And the Making! Four movie freaks from Hungary decided to twirl the common chat habits to extraordinary comic videos. They are all thoughtful coders, communication specialist and business designers. ClipDis is their passion. David was cable surfing, and quick switches between TV channels which when clubbed together resulted in a funny mash-up. This revived the idea of ClipDis. The biggest challenge was to believe in the instincts. The fact that abstract ideas like ClipDis can evolve into a business model. It was strenuous to invest time apart from earning livelihood. “We took this first steps, but the real progress is ahead of us. We turn ClipDis from a crazy idea into a serious business with a smile”. Boredom is a curse and to avoid it people start chatting. Chatting can really swipe you away from the boredom. Everybody wants to send the most creative and fun messages that go viral.Be the entertainer! It is ‘One tap mash-ups’ creativity Application. At times, there is a lack of context while texting. Moreover, texting is confusing, missing the dots of expression and compromised smiley’s. It is because we lost our tools (mimic, gestures, tone of voice) to express ourselves during texting.When the text is, exemplified by Oscar winning emotions or even with a funny gesture from Youtube videos. Users will be able to select mashup’s based on mood, artist, movie or even genre. They can create the one really describing their message, fitting their emotions. “Basically we compete with every tool or even in app feature which makes texting more colorful – gif messaging, stickers, meme creators etc”. They are all built on the same insight and offering various answers. crumbles.co – it basically has the same concept but with smaller word database (we have already more than 20k words and expression), and not that engaging content output. popkey – This is also gif sending app, keyboard integration. “We see ClipDis turning from a one-time fun tool to an entertaining and expressing way of everyday communication”. The product will be more engaging in days to come. The supporting community will create quality contents to widen it. The ClipDis videos will be more personalized. Sophisticated video creating algorithm based on video tags (mood, artist, etc). Filtering tools will be available. In-app messaging will also be featured sooner. 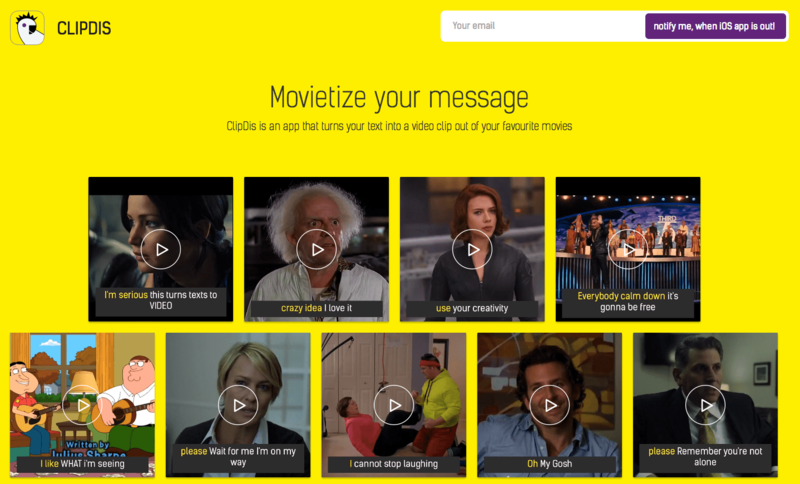 “We want to reach out to vine artists, gif makers, movie enthusiast to start using ClipDis and show how great mash-ups can be generated with it”. The product is designed for general users like teens and YA. But there are these creative communicators who post meme’s on tumbler, they react to funny gif on posts. However, there are narrower TG’s for whom ClipDis is attractive. Language learners can use ClipDis to learn English with fun. Nevertheless, there are some interesting concepts for film studios, and content providers .Just imagine what StarWars fans could do with a StarWars special word package pre-launch the new episode.It provide you a special list of words (like cheats or Easter eggs) showing funny reactions or abstract words (e.g. just type: blublubla or ngaah). If you ask your readers to pick/vote a movie or TV series which they would like to see in ClipDis the most, it will be included within 48 hours. This app will heighten the use of social network and texting with its charisma. So what are you waiting for? Let us mash-up our chats! Previous articleHood Helps You Mingle With Your Neighbors!